Clematis Street is right at the historic heart of West Palm Beach and is home to some of the area’s best restaurants, shopping and nightlife. Busy by day and perhaps even busier by night, the colorful district is home to twelve historic landmarks that tell the story of the area. Detailed architecture represents centuries of eclectic styles, while the many fountains and gardens (along with oceanfront location) make this an especially scenic spot. Boutiques line the street, which is full of antique shops, restaurants, art galleries, and cafes (Antique Row features 40 specialty shops alone.) Boats dock at the floating pier at the water’s edge, and year-round water sports and activities can be launched from nearby. By night there are often live music performances or music booming from one of many nightclubs. 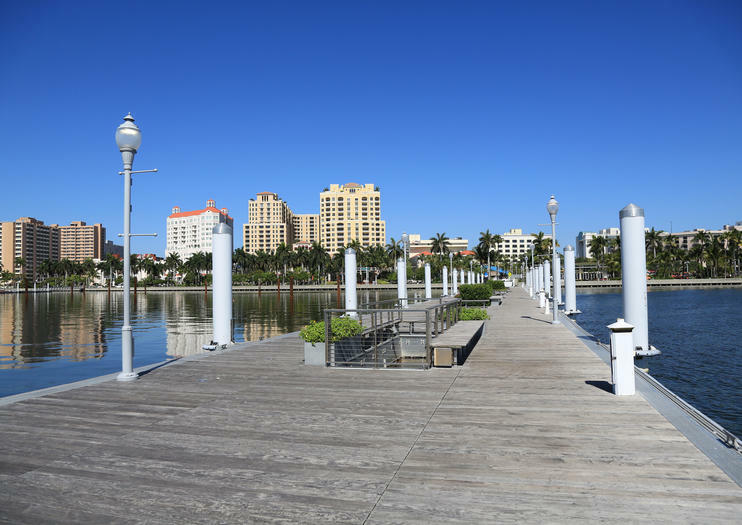 The area is known for its nightlife particularly on Thursday nights, when it transforms into a lively street party called ‘Clematis By Night.’ The event also hosts weekly free concerts on the waterfront. Clematis Street runs parallel to Okeechobee Blvd in downtown West Palm Beach, which is also the name of the nearest exit off of I-95. The main area of Clematis Streets beings at Flagler Drive on the Intracoastal Waterway and continues west. Street and garage parking is available. Walking is the best way to get around, though there is also a free shuttle that runs the length of the main street. Pedal a 4-wheeled party bike through West Palm Beach's downtown on this lively 2-hour activity. With your driver/guide and up to 15 passengers, stop your bike, also known as a pedibus, at 3 local hot spots along Clematis Street and CityPlace to sample some of the city's best libations (3 complimentary, 1 at each location). Listen to your guide's engaging commentary about the night life, culture and history of West Palm Beach as you ride.